The founder of the line Yamashita Matatarô I held this name from the 11th lunar month of 1734 to the 9th lunar month of 1762. Dates of birth and death unknown. Son of Yamashita Matatarô I, he did his training with his father, who gave him the name of Yamashita Iwatarô. He took the name of Yamashita Matatarô II in the 11th lunar month of 1766, performing in the kaomise drama "Yamato Uta Hikime no Yaguruma", which was produced by Nakamura Utaemon I. His name appeared for the last time on a theater playbill in the 12th lunar month of 1767. We don't know what happened to him afterwards. Dates of birth and death unknown. His first stage name was Takinaka Iwanojô, which appeared in the Moritaza playbill in the 2nd lunar month of 1773. He took the name of Yamashita Matatarô III in the same theater in the 11th lunar month of 1774, performing as a wakaonnagata in the kaomise drama "Ichi no Tomi Tsuki no Kaomise", which celebrated the arrival in Edo of Nakamura Tomijûrô I and his adopted son Nakamura Shingorô II. He most likely performed in Edo up to 1777 but his career was not really successful and his fame did not rise. He was the adoptive father of Yamashita Matatarô IV. Dates of birth and death unknown. 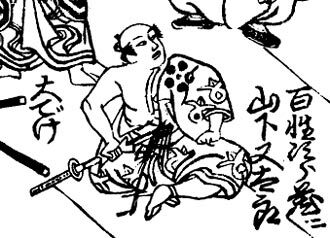 Disciple of Nakamura Sukegorô II, he was recorded for the first time in the 11th lunar month of 1772, when he performed as a tachiyaku at the Moritaza in the kaomise drama "Izu Goyomi Shibai no Ganjitsu", which celebrated the shûmei of Sawamura Chôjûrô IV, Sawamura Kijûrô II and Mikuni Fujigorô. He was adopted by Yamashita Matatarô III and took the name of Yamashita Matatarô IV in the 11th lunar month of 1777 at the Moritaza, performing as a tachiyaku in the kaomise drama "Hito no Kuni Yori Mitsugi no Irifune", which celebrated the return to Edo of the actor Sawamura Sôjûrô III. He was active in Edo up to 1783. No record afterwards.